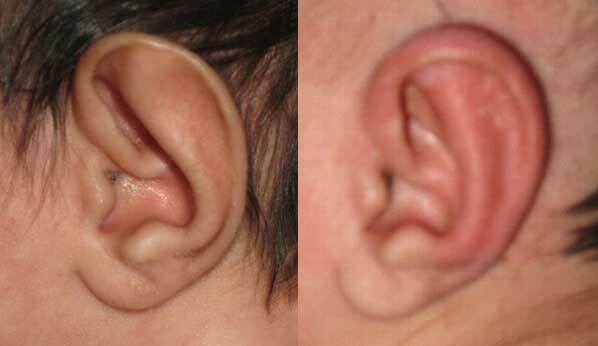 Congenital ear deformities in infants range from small ears, ears pointed at the top, ears that stick out far from the side of the head, ears that are lopped or whose upper half leans away from the side of the head, ears that are cupped or restricted (bent in the middle so the top and bottom move towards each other away from the side of the head) to absent ears. Historically the treatment for most of these was surgery. Splinting of the ears shortly after birth to reshape the ears by ear molding so surgery would not be needed later on has been a known entity but the splints had to be made by the doctor and were not reliable. Now we have commercially available Earwell splints that have a more reliable result. The splints are placed preferably within a week or 2 of birth and splinting is continued for 4 to 6 weeks but good results have been obtained with babies as old as 6 weeks. If started early after birth while the ears are still soft the results can be remarkable and the baby will then not need any ear surgery. An initial splint is placed and left in place for 2 weeks. Another splint is placed for an additional 2 weeks. Then the ear is either taped for 2 weeks or a third splint is placed for a final to weeks to complete the treatment. The procedure is covered by health insurance. This 6 week old infant responded to 39 days of earwell splinting with complete resolution of the ear deformity. This baby was born with cupped, lopped or constricted ears. Earwell splints were placed at a week and a half after birth. A second set of splints was placed 2 weeks later. After 4 weeks of splinting tape was applied for 2 weeks. This effectively corrected the ear deformity by ear molding. This treatment is only effective in the first to second month after birth. After that surgery is the only option. As each patient is an individual, different results can be expected in each patient. The only alternatives to the Earwell splinting is surgery when the child is about 5 years of age. The risks are minimal for this non-surgical splinting and basically limited to skin breakdown or pressure sores from the pressure of the splint. The benefits are not having to have surgery at an older age and comfort that there is less chance of your child being bullied by peers in their formative years. Your child will never remember the treatment and will only see the benefits. The splinting period lasts 6 weeks with splints reapplied in 2 week intervals after which no further treatment is usually required.